Having made the brain in a jar I needed something to act as a stand for it. 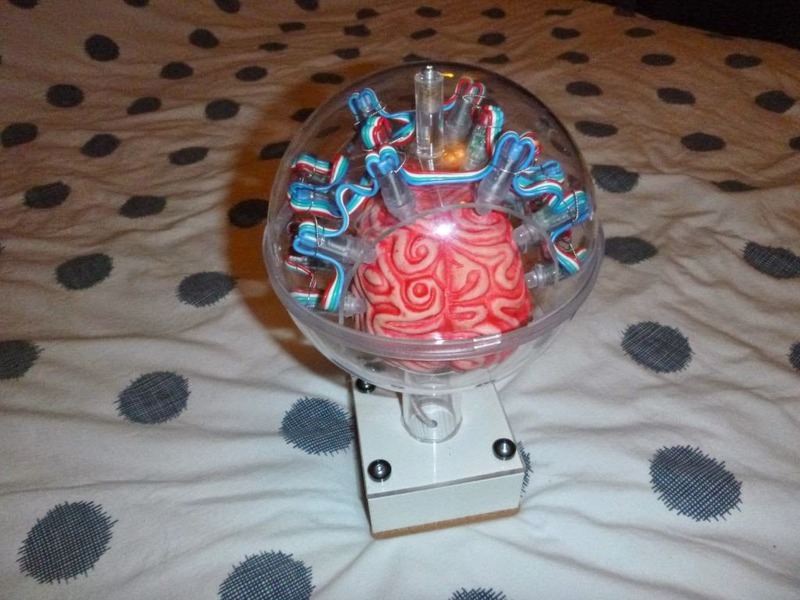 I also wanted to make the business end something that I can re-purpose for multiple props, as a brain in a jar is always useful. For the first go at the stand it needed to be compact and quick to throw together. It occurred to me that some time back I bought a set of metal desk organisers from IKEA so that I could turn one of them into my medical scanner. Being clean and white gave that a strong 'medical' look which would work for the brain too. So I fitted a square acrylic base the same size as the IKEA box to the brain and mounted it to the box with four bolts. This is a nice generic fitting that will allow me to bolt it onto something else later if I feel like it. The box has precious little inside, an Arduino Nano, socket for the mains PSU and on/off switch. It is however big enough for an RPi if I want to make it speak later. Here it is complete and running, although the video doesn't show the colour cycling very well.